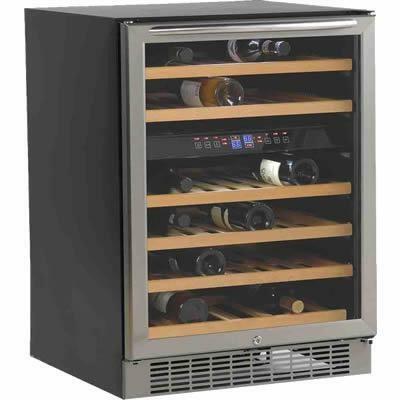 Avanti 24" wide wine chiller can store up to 46 wine bottles, with dual zone. Features amber LED lighted control panel for easy viewing. Wooden shelves on a pull-out roller assembly. Reversible double pane tempered glass door with stainless steel frame and top mounted handle. Temperature Settings Red Wines: 59 - 65 ºF 15 - 18 ºC. Dry / White Wines: 50 - 55 ºF 10 - 13 ºC. Rose Wines: 49 - 51 ºF 9 – 11 ºC. Sparkling Wines: 40 - 47 ºF 5 - 8 ºC. Additional Information 24" Wide and Stores up to 46 Wine Bottles. 16 Bottles In The Upper Zone. 30 Bottles In The Lower Zone. Reversible Double Pane Tempered Glass Door with Stainless Steel Frame and Top Mounted Handle. Soft Touch Internal Electronic Control & Display Panel For Monitoring Temperature (°C/°F) for Each Zone. Amber LED Lighted Control Panel For Easy Viewing. Wooden Shelves on a Pull-Out Roller Assembly. Select Shelves Designed to Accommodate Burgundy Bottles. Red, White, or Sparkling Wine Indicator Lights. Long Life & Cool LED Door Actuated Interior Display Lighting with ON/OFF Switch to Showcase Wine in each Zone. Warranty 1 Year limited parts and labor. For the second through the fifth year from date of original purchase, Avanti Products will provide a replacement compressor free of charge due to a failure. You are responsible for the service labor and freight charges. In rental or commercial use, the limited compressor warranty is one year and nine months. Cost to move the appliance to the servicers' shop and back to the user's home, as may be required, are the user's responsibility.